Getting a business credit card without any personal credit can be difficult but it’s not impossible. As a small business owner or entrepreneur just starting out, your personal credit history can be directly tied to the various lines of credit that may be available to you. But what if you don’t have any? The road to being approved for a business credit card can take a while longer if you don’t have any established credit history but there are ways you can improve your chances of getting one. Before we dive in, it may be helpful to understand the perspective of how lenders and credit card companies view your personal financial history, as it relates to being approved for loans and credit cards. In a nutshell, loan and card issuers use credit history as a benchmark to decide if someone is financially responsible and pays debts on time. Without this history, there’s a blind spot in measuring the safety of their investment extended to you. With that said, here’s how to increase your chances of being approved. One way to improve your chances of being approved for a business credit card is piggybacking off of someone else’s good credit score to help boost your own personal credit history. This involves your name being added as an authorized user on someone else’s credit card account. It could be your parents, a spouse, a sibling, a business partner, etc. There's no guarantee, of course, but I've personally done this to help a few family members and friends who saw a 50 point increase on their scores in 3 months on average. As long as the primary account holder maintains a good or excellent score, your own score may see a quick boost, which heightens the likelihood of being approved for a business credit card. Another option to consider is getting a secured credit card while you work on building up your credit history. Building credit takes time – even when using the strategy above – so it’s good to weigh your options. If you’re looking to add a card to your wallet in the near future, a secured card may be the way to go. Secured credit cards may be easier to qualify for with no established credit but they do typically require a security deposit. The security deposit usually equals the card’s credit limit. Many secured credit cards report to the major credit bureaus, which could help you qualify for unsecured business cards down the road. Choosing a Secured Credit Card: What Should You Look For? While the selection of secured credit cards can be limited, it’s still important to find the one that best fits your needs. Here are a few things you should look for when choosing a card. The majority of secured cards have a minimum deposit of $200 to $300. While it can be a challenge just coming up with the minimum, the more you’re able to put down for a deposit, the more flexibility you gain. Using too much of your available credit on a regular basis can hurt your credit score. Making payments on time is a key element of building a great credit score, but life happens, and sometimes late payments are unavoidable. Look for a secured credit card with a built-in grace period, so interest does not accrue for a certain amount of time (usually around 25 days) if you fall behind on a payment. 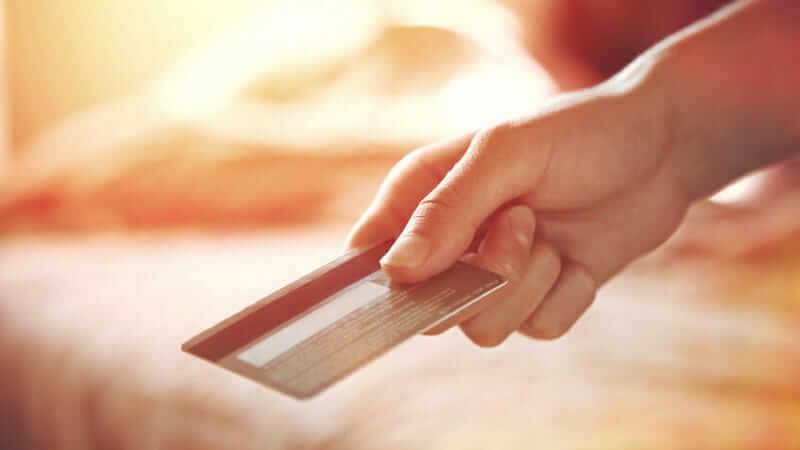 Many good secured credit cards charge $0 to $40 in usage fees, which is standard, but use caution when selecting a card with high annual fees, monthly maintenance fees, and other unavoidable charges. These cards, known as “fee harvesters,” can rack up fees quickly. How Long Until I Can Qualify for an Unsecured Business Credit Card? Starting a new business is exciting and you may want to act quickly to avoid losing momentum, which is completely understandable and admirable, I’d say. But the honest truth is: Building credit takes time. Realistically, if you’re just beginning to establish credit for the first time, you may be looking at a year or longer before you qualify for an unsecured business credit card, which is why a secured credit card may fit the bill for right now. What First Steps Should I Take to Build Credit? Building a good credit history while you grow your business is a fantastic idea that will benefit you in the long run. To hit the ground running, you’ll want to first understand the five factors that affect credit: Payment history (35%), credit utilization (30%), credit age (15%), account variety (10%), and credit inquiries (10%). Then, keep tabs on your credit report and track your score as your credit gets established. Credit Sesame offers a free credit score report that I recommend. As your personal credit history grows, you may be able to improve your score even faster by using a few creative strategies that demonstrate responsible credit usage and management. Applying for a secured credit card may also help boost your score. Don't be discouraged from starting your business with no credit. Although it may take some time for you to establish your credit history, it's not the only way to fund your business and doesn’t need to feel like a huge roadblock preventing your success. Focus on building up your personal credit so you can eventually apply for an unsecured business credit card, and consider applying for a secured credit card in the meantime to build credit for your business.